The Music & Arts Library & Asian Music Humanities faculty have recently partnered to create an Asian Music Humanities – Class Resources page, on the Music & Arts Library home page. The page currently contains links to a glossary, and to a list of suggested concerts and venues for students. 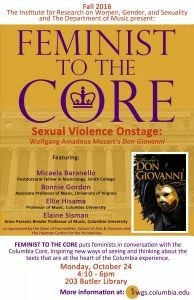 Music faculty Ellie Hisama and Elaine Sisman will participate at the IRWGS “Feminist to the Core” series event “Sexual Violence Onstage: Wolfgang Amadeus Mozart’s Don Giovanni“, on Monday, Oct.24, from 4:10-6pm, in 203 Butler Library. Don Giovanni will also be a featured opera for Music Humanities sections this fall. DVDs of several different productions are on Reserve in the Music & Arts Library to support these classes. 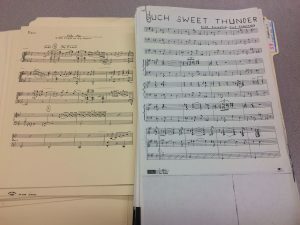 Undergraduate student Kira Daglio Fine, saxophonist and leader of the Columbia University Big Band, is working with Duke Ellington materials from his Such Sweet Thunder, from the Mark Tucker Collection, in order to prepare an arrangement for performance in Spring 2017. She’s re-working her arrangement into digital music notation. She’s offered to guest-post in the future to our blog about the experience of working with these materials, as her work progresses. We’re excited! This entry was posted in Archives, CU Community Performances, Events, news on September 29, 2016 by Nick Patterson.